I have been teaching Isabelle to write her name the past few weeks. She has had absolutely no interest in numbers or letters at all, so this sudden interest has been great. You can see the various letters of her name on the top. 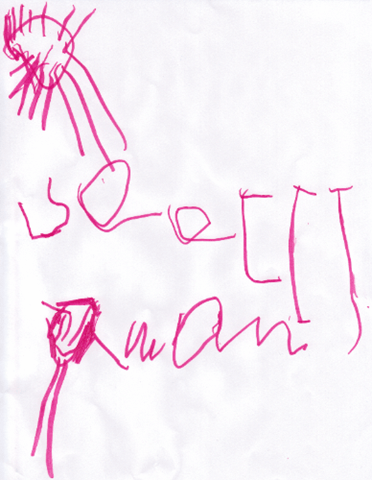 On the bottom is her first written word….M-O-M. Rob taught her that last night, and she remembered it till this morning. She also told me this week that she would rather I be her Mommy than Gazelle from Enchanted. It’s been a great week for this Mommy. I saw you at church last night (in the ladies room) and wanted to introduce myself and tell you how much I enjoy your blog. However, not wanting to miss any of the service, I ran into a stall and tried to be quick. When I was done, you were gone. Maybe some day I will see you again and have the opportunity for introductions. I am glad you got to scrapbook. I haven’t touched my scrapbooks since October. *pout* Have a great weekend!